It is possible to solve many problems in two-dimensional supersonic flow by patching together appropriate combinations of the oblique shock wave, described in Section 15.2, and the Prandtl-Mayer expansion fan, described in Section 15.6. For example, let us consider the flow over a simple two-dimensional airfoil section. Figure: A flat lifting plate. is the upstream Mach number, , , et cetera, denote pressures, and is the angle of attack. Note that the drag that develops on the airfoil is of a completely different nature to the previously discussed (see Chapter 9) drags that develop on subsonic airfoils, such as friction drag, form drag, and induced drag. This new type of drag is termed supersonic wave drag, and exists even in an idealized, inviscid fluid. It is ultimately due to the trailing shock waves attached to the airfoil. 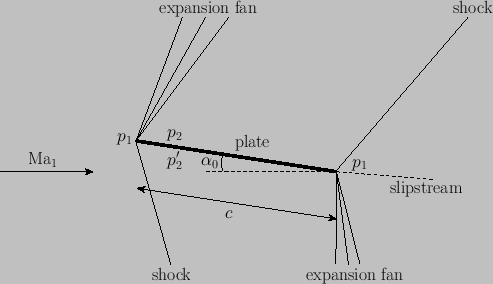 Comparatively far from the airfoil, the attached shock waves and expansion fans intersect one another. The expansion fans then attenuate the oblique shocks, making them weak and curved. At very large distances, the shock waves asymptote to free-stream Mach lines. However, this phenomenon does not affect the previous calculation of the lift and drag on a flat-plate airfoil.